Business today seems to be all about busy-ness. But in the rush to achieve we sometimes lose sight of the real goal. 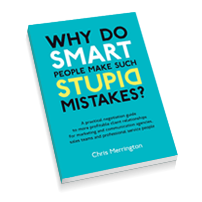 As Chris will tell you, improved business performance isn’t about running faster, it’s about thinking smarter. It’s about truly understanding what your real impact is on your clients and how to best deliver that. Chris makes your team rethink their approach to clients by using proven practical techniques to achieve improved business performance. His clients typically see business improvements of 10-15% in terms of profit growth, increased client retention and higher sales. He will tailor his content to suit your business needs so that your people are fully engaged. Before the event he will spend time with you to help understand the purpose of the conference, the audience and the challenges you face. As a Fellow of the Professional Speaking Association and Deputy President of the London region, Chris’s natural, interactive style engages, entertains and energises audiences leading to action not just good intentions.